We live in England and have 3 children and 3 grandchildren We purchased this villa due to the size, location and style and its amazing views. We try to get out there as much as we can. All we can say is that the people are fantastic, weather is always hot and there is plenty to do if you are feeling energetic or just chill out and relax. We purchased this villa as it is slightly out of town but very close to get into, but most importantly it is so peaceful when we sit around the pool in our garden and the views are amazing. There is a lot to do here and if you are a golf fanatic, nearby is Belek which has numerous golf courses. The master bedroom has a jacuzzi bath within bedroom and separate toilet and vanity area, with storage drawers underneath granite worktops. All other bathrooms have large walk-in showers, toilet and vanity areas and storage areas. Hairdryers included. Spacious and beautifully set out lounge with L-shape sofa, coffee table, 42" Flat screen TV, Video and Digiturk satellite TV. Ipod sound system, Sideboard . Sliding patio doors opening up the whole room, leading out to large terrace & pool. Kitchen/Diner and has a luxury island feature with built in hob, oven & extractor, with black granite worktops. Very modern & fully fitted with washing machine, fridge/freezer, microwave, safe, kettle, toaster,sandwich maker, coffee maker & all utensils. For golf enthusiasts, nearby Belek is the golfing capital of Turkey and is a golfers paradise with 12 championship course and a links course attached to the 5* Lykia Hotel. Distance is approximately 30 mins away. Transfers can be arranged. Bookings can be made direct to the courses. One of the places you can book tee times direct is at the World Renowed Caryagolf course in Belek. Notes on accommodation: Smoking is not permitted anywhere inside the villa. No pets are allowed. Hairdryers are provided in all the bathrooms for guests use and Ipod alarm clocks are also provided in all bedrooms. Sofas in lounge are not to be used as additional beds. There is underneath storage (below mattress) on all beds, providing extra duvets & blankets. Outside: Set in beautifully landscaped gardens the private pool enjoys uninterrupted views of the Taurus Mountains. There is plenty of outdoor space for seating and sunbathing. All outdoor furniture is very modern and Rattan in design. Each balcony has seating where you can sit and overlook the pool/garden. Also provided is a BBQ to enjoy eating outside. Within the complex is plenty on offer. Tennis courts, gym, restaurant, sauna, children's play area, communal indoor and outdoor pool. The villas also have their own security guard throughout the night, there is 24 hour security provided on site. Also a free shuttle bus service for all residents taking you to and from the complex and a separate bus to the beach. Please look at time table which is in the villa or located at the entrance to four seasons. Pool is private and has ample surrounding space to put loungers and chairs. Pool is cleaned and maintained daily and is carried out early hours of the morning.A washing line is available Utility Room: This is outside and used as a store room, for outdoor furniture, BBQ and additional towel airers and laundry basket and garden items such as Tennis racquets, swingball, kids toys and inflatables. Cleaning / Towels / Linen / Maid service: Bedlinen, bathroom & pool towels are provided. Full cleaning before & after your stay is included. Mid stay clean can be arranged at an extra cost. Daily pool cleaning is carried out. Regular gardening is maintained. Iron & ironing board available. Other: Villa sleeps 8,(But an additional put up bed can be used for 1 additional guest & an extra £25 per night will be charged)This must be confirmed at booking. Single beds can be pushed together to accommodate 3 children allowing maximum sleeping room. I wanted to have a lovely all the family" together" holiday and what I got was the most fantastic holiday ever.To start with Sharon (the owner) was very very helpful with everything this end arranging transport and car seats etc ,telling us all she had there so not to over pack. InTurkey we were transported to villa and oh my god what a beautiful place it is.So spacious and like Sharon says home from home. Jenny was on tap for anything we needed, and we had a fabulous time. The people cant help you enough, and prices are so reasonable. I would very highly recommend this villa to stay. I will definatly be returning. Thank you so much for your lovely review. Im glad you had an enjoyable holiday. Had a fantastic stay at this top of the range villa last summer in August last year. We were two families of four and there was plenty of space for all of us. It truly is luxurious and very well equipped. The area of Turkey was very nice too & Sharon gave us plenty of information before we arrived. I would recommend hiring a jeep or car to get around on some days. We would definitely go back. Sharon was very helpful and flexible with arrival dates. All in all we had a very pleasant stay. We did have issues with the TV and power cuts, but it was sorted out eventually. The management people however do rely on contact by Whatsapp, which when you don't have an internet connection is not very useful. The villa doesn't have it's own internet connection which is a bit misleading, you can however get it at the restaurant - which is very friendly and the staff are very welcoming. Thank you for your review. Unfortunately we had just changed over management companies and the new internet was in the process of being installed at that time, and we did have some teething problems with the TV due to this as originally we had Digiturk which didn't give many English channels for our renters so we chose to have it by internet, so that you could get a lot of variety. We had to rely on the site wifi which could be intermittent. The villa now has its own personal internet. Usually you just call up the management company and they respond very quickly or onsite security can help. There should be no reason to whats app, so apologies for this. You can also call and message direct to the company who will respond quickly or speak to security onsite. Unfortunately any short power cuts are out of our control. This can be normal at times in the summer. Generally they are resolved quickly. Thank you once again for renting. Im glad you had a good holiday. Car wasn't needed as the courtesy bus was excellent. I would just like to say that thank you for letting us have the luxury of staying at your villa. 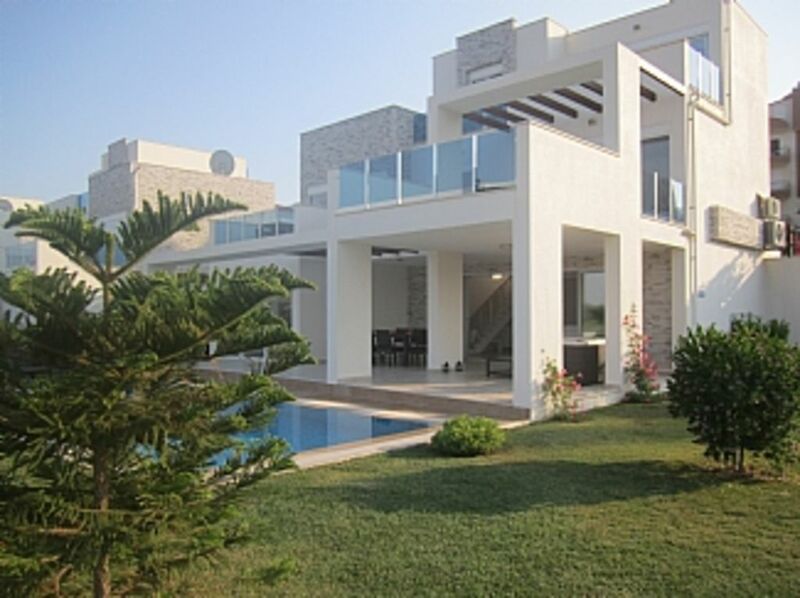 Impressive, modern and very spacious villa in a very quiet location but with easy access to the excellent resort of Side. The owner was extremely helpful and flexible at every stage of the process which was a big advantage. One of the best villas we have stayed in and as a total package it would be difficult to beat. Highly recommended. The beautiful sandy beach is 5-10 minutes drive away, using the free beach bus. Sun loungers and umbrellas are provided at the waters edge. Excellent food is served by the friendly, multi-lingual staff at the restaurants on the beach. Water sports are on offer including para sailing, jet skis, ringo's and banana boats, or take a leisurely stroll along the beautiful newly completed beach promenade. There are 2 beaches, east & west. The quieter beach has a protected area for the turtles. Antalya Airport, which is connected to most UK airports, is a 40 minute drive away. Regular flights can be booked through a number of carriers (e.g. via internet sites - flythomascook, sun-express, travelrepublic or cheapflights). Airport pickups can be organised by the owners in advance. Car hire is not essential unless you want to explore. Local buses called Dolmas are very cheap and they go just about anywhere. There is a free shuttles bus that runs to and from the complex every 2 hours. The holiday resort of Side and Manavgat, the nearest major town, are both 15 minutes away by car or bus. The beautiful cities of Antalya and Alanya are 45 minutes away. Aspendos, with it's beautifully preserved amphitheatre, which still hosts many concerts in the summer months, is half an hour away, with the fabulous remains of Perge a similar distance from the villa.The Roman ruins of Side boasts three temples including the 4 remaining pillars of the Apollo Temple overlooking the Harbour. Magnificent water falls at Manavgat, the protected Sorgun forest where you can enjoy horse riding, a coastline which offers you infinite adventures and for the less energetic days, Turkish baths and massages.The small museum in the town houses many relics and provides a fascinating insight into the history of Side. Just along from Antayla airport you can enjoy a family fun day @ Tree-tops an adventure park, where one of the activities you can do is swing from high up trees. Duden waterfalls is another place of interest to enjoy. Any excursions can be booked through one of the agents at the harbour in side or Kumkoy at one of the local excursion companies or even at the restaurant on site. Other activities close by include white water rafting, jeep safaris, thrilling scenic adventure through the beautiful Koprulu Canyon National Park or up into the spectacular Taurus Mountains which form the backdrop to the area. There is a huge aqua park in Antalya and Alanya where you can have adventurous fun with rafting, bungee jumping and slides. At the Dolphin Park in Antalya you can touch and swim with dolphins. Horse riding, quad biking and fishing are all close at hand. An annual summer festival takes place at Aspendos Amphitheatre, staging evening performances of opera, ballet and music. There are a few local restaurants and shops near to the villa if you don't want to venture into town, these are located at the top of road along from the Four Seasons complex which is all part of the same development. Side Old Town has an abundance of excellent restaurants and along the new promenade walkway which skirts the beach. Booking Notes: Bookings will be held for 48 hours. Balance due 6 weeks prior to departure. A refundable security deposit of £250 is payable with the final payment, & will be returned up to 14 days later once the villa has been inspected & no damage has occurred. Guests should ensure that they have their own insurance cover for personal injury, loss of possessions, damage to property & cancellation. Terms & Conditions are sent out with booking. Changeover Day: Occupancy depends on arrival.Departures after 12 noon will incur a surcharge of £10 p/hour which is a compulsory condition when booking villa. This enables you to have full use of villa until departure, which is ideal if you have a night flight. Notes on prices: Departures later than 12noon will incur a surcharge of £10 per hour,which is a compulsory condition when booking. Transfers to & from airport are compulsory as this is when you are given keys & is a requirement from security(unless agreed at time of booking) Car hire can be arranged prices on enquiry & brought to villa. Airport transfers can be arranged and costs given on enquiry. If you require extra cleaning during your stay this can be arranged at an additional cost.